There was a time when crystal domes dotted the landscape of the Troll Hills and sky sleds cut through the air like ships through the waves. That was long ago. The ancient, golden-skinned men, they say, built their domes too near the great lake from which all life sprang, and so the lake spawned the trolls and more fearsome creatures to punish the ancient men. Whatever the truth is, the ancient men were laid low, the cities crumbled, the survivors turned out into the wilderness and the hills were left to the trolls. The Troll Hills are mostly gentle, rolling hills covered with green grass and dotted by woodlands of oak and hickory. They are bordered to the south by the Devil Peaks, jagged mountains that are home to the devilkins. To the north there is the Zarko Mountains, with valleys of pines where dwell dwarves in colorful coats who make rare distillations. 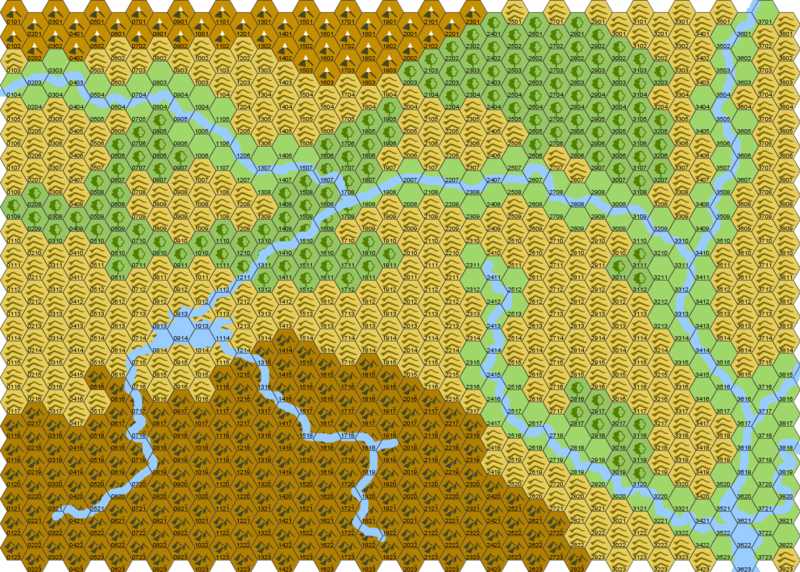 The hills drain into the Sapphire River and Great River, which connects the Valley of the Hawks to Crescentium, the city-state of the witchmen to the south. The Great River has proven a great boon to trade, but now the petty trolls have occupied the ancient fortress on Little Rock  and shut down that trade, cutting Crescentium off from its markets in the north. Perhaps the adventurers might sally forth from north or south to open the river. Or maybe they’ll ignore the wars of the trolls and witchmen and instead delve into the wilderness in search of the secrets behind the weird blue ruins of the ancient men. Among the more pernicious and dangerous creatures in the Troll Hills are the trolls and their hag mothers. Most trolls are born from hag mothers and human or demi-human fathers. Under a full moon, hags are capable of appearing to males as nymphs in order to seduce them. Like some spiders, the hags usually eat male after they have mated. About one out of twenty troll births is a female that can breed true with other trolls. Trolls born from hags usually nurse from their mother for about two weeks, at which time they are about four feet tall and capable of catching their own food. The hag then drives the troll from its lair. Trolls return to their mothers from time to time to pay tribute. Hags have an equally bizarre life cycle. A hag is an elven women that has reached their allotted 1,000 years of life as an elf. At this point, lawful elves wander into the woods and become nymphs. Neutral elves find a nice oak tree and turn into dryads. Chaotic elves crawl into a damp burrow or fallen log and cover themselves with mud and leaves. After one month, the elf emerges as a hag. The three hags who gave issue to the petty trolls have recently come together to form a covey and spread their dominion over the Troll Hills and maybe beyond. These hags, Peggy Blackteeth, Mollie Longshanks and Fat Anya, because they have formed a covey, can now cast the following spells three times per day each: Animate dead, control weather and phantasmal force. Groovy! I especially like the legends surrounding the lake of life and and the gold skinned men. Yup. You're hex crawls are pretty damn good.